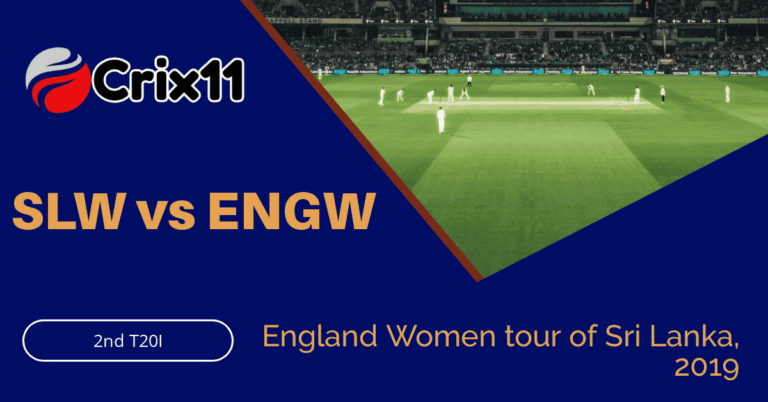 If you are looking for ENGW vs SLW Dream11 Prediction, 2nd T20I which will be played on Tuesday, March 26, 2019, at Colts Cricket Club Ground, Colombo then you are at the right place. You can find all the details which can take you to the top position in any fantasy cricket leagues. We have covered the pitch report of Colts Cricket Club Ground, Colombo, players recent and past performance, the best choice for captain and vice-captain and weather report. Yet another victory for England Women against Sri Lanka Women in the 1st T20. The bowling department has completely dominated the SL-W and restricted them on 94/10. Imalka Mendis, Hansima Karunaratne and Oshadi Ranasinghe were only the batswomen who managed to touch two digit mark. They have scored 14, 19 and 20 runs. Even the bowlers failed to contribute. Chamari Athapaththu was only the player who took one wicket. On the other hand, EN-W had continued their ODI performance in the first T20I. The bowlers have managed to restrict the SLW. Linsey Smith, Anya Shrubsole and Freya Davies did an outstanding job with the bat and took 3, 2 and 2 wickets respectively. The England Women batswomen chased the total quite easily. Tammy Beaumont, Amy Ellen Jones, Danielle Wyatt, and Natalie Sciver have scored 50, 18, 15 and 11 runs respectively. Chamari Athapaththu, Shashikala Siriwardene, Imalka Mendis, Hansima Karunaratne and Oshadi Ranasinghe are the key players of Sri Lanka Women Team. Chamari Athapaththu will lead the SL-W team. Hansima Karunaratne, Imalka Mendis and Anushka Sanjeewani will lead the batting department. Chamari Athapaththu, Shashikala Siriwardene and Nilakshi de Silva will play as a key all-rounder. Oshadi Ranasinghe, Inoshi Priyadharshani and Oshadi Ranasinghe will lead the bowling department. Chamari Athapaththu and Shashikala Siriwardene are the most valuable players of Sri Lanka Women Team. The SLW team management may decide to play with the same playing XI. Batswomen: Hansima Karunaratne, Imalka Mendis, Umesha Thimashini, Harshitha Madavi. All-Rounders: Chamari Athapaththu, Nilakshi de Silva, Shashikala Siriwardene. Bowlers: Inoshi Priyadharshani, Oshadi Ranasinghe, Achini Kulasuriya. Chamari Athapaththu(c), Inoka Ranaweera, Anushka Sanjeewani(w), Oshadi Ranasinghe, Umesha Thimashini, Inoshi Priyadharshani, Shashikala Siriwardene, Sugandika Kumari, Imalka Mendis, Nilakshi de Silva, Harshitha Madavi, Achini Kulasuriya, Hansima Karunaratne, Hasini Perera, Madushika Methtananda. Danielle Wyatt, Tammy Beaumont, Amy Ellen Jones, Natalie Sciver, Anya Shrubsole, Freya Davies and Linsey Smith are the key players of England Women Team. Heather Knight will lead the EN-W team. Danielle Wyatt, Tammy Beaumont and Amy Ellen Jones will lead the batting department. Natalie Sciver and Heather Knight will play as a key all-rounder. Freya Davies, Anya Shrubsole and Linsey Smith will lead the bowling department. Danielle Wyatt and Tammy Beaumont are the most valuable players of the England Women team. The ENGW team management may decide to play with the same playing 11. Batswomen: Danielle Wyatt, Tammy Beaumont, Sophia Dunkley Brown, Lauren Winfield. All-Rounders: Heather Knight, Natalie Sciver. Bowlers: Linsey Smith, Anya Shrubsole, Freya Davies, Laura Marsh. Heather Knight(c), Danielle Wyatt, Freya Davies, Tammy Beaumont, Georgia Elwiss, Amy Ellen Jones(w), Kate Cross, Natalie Sciver, Anya Shrubsole, Lauren Winfield, Linsey Smith, Sophia Dunkley Brown, Sophie Ecclestone, Laura Marsh, Katherine Brunt. The pitch of Colts Cricket Club Ground favours the spinners and the same can be expected in the 2nd T20I. The batswomen can also take advantage of the wicket if they play proper shots. Dream11 Fantasy Cricket Tips: Try to take top-order batsmen and spinners in your team. The weather of Colombo is forecasted to be mostly sunny and it will remain the same throughout the day. The sky will be clear and there is no sign of rain today. A hot and humid day is predicted. The temperature is expected to be 30-Degree Celsius and the humidity to be 59%. Dream11 Fantasy Cricket Tips: The weather condition will favour the spin bowlers. After the clean sweep of ODI, England Women will target to repeat the same in the T20I. If we look at the last five matches, ENGW has won four matches and one game was abandoned. SLW has failed to register a single win. According to crix11 astrology prediction, ENW will win the match. The team winning the toss should opt to bat first. According to Crix11 astrology cricket prediction, ENW will win the toss and ask SLW to bowl first. This is it for Today’s ENW vs SLW Dream11 Fantasy Cricket Prediction 2nd T20I. What is your best team? Leave a reply in the comment section.